A common fly fishing knot, the ‘nail knot’ is a rudimentary must-have for the professional fisherman. It involves the attachment of a small object, such as a tube twice the diameter of the line, to the fly line itself, and then attaching the line to the backing. Place the object at the end of the fly line with about two inches of excess, making about a two inch loop at the weighted end of your leader. Pinch the loop to the object. Next, get the small end of the leader loop and wrap about five times around the object and actual line. Each ‘wrap’ should be at least one-half inch from the end of the fly line. Move the thumb forward to keep it from unwinding, and move the end of the leader through the tube from right to left. Remove the tube, and tighten the knot by tugging both ends of the leader. The idea is to make it more consistent with the fly line. 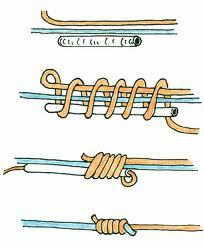 Complete the knot by pulling the line through, trim the leader excess, and you’ve finished the nail knot. It is a leader to fly line knot. This entry was posted on Wednesday, July 27th, 2011 at 2:47 pm	and is filed under Fly Fishing, Fly Reels, Flycast Reels, Lures, Tips. You can follow any responses to this entry through the RSS 2.0 feed. You can skip to the end and leave a response. Pinging is currently not allowed.